Card Text Play: Destroy a damaged creature. If you do, steal 1 . Flavor text You’ll never see it coming. Can I use Finishing Blow to target one of my own creatures? Yes. The only restriction is that you target a damaged creature. Therefore, you can target one of your own damaged creatures. If I play Finishing Blow and there are no damaged enemy creatures in play, do I have to destroy a damaged friendly creature? Yes. It is mandatory to resolve as much of an effect as possible. Therefore, if you are the only player with damaged creatures, you must choose one to destroy. If I use Finishing Blow on my own creature, do I steal the 1 Æmber from myself? No. When an ability steals Æmber, the stolen Æmber is removed from your opponent’s Æmber pool and added to your Æmber pool. Therefore, you would steal the Æmber from your opponent. 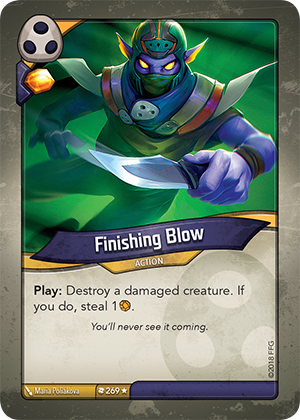 If there are no creatures in play, may I still play Finishing Blow to gain the Æmber bonus?